As a new year in Kansas Jayhawks football approaches, we look back on the past decade of KU football to try to better understand how the Jayhawks slid to the bottom of the college football food chain. Since Turner Gill took the reins of the program in 2010, the Jayhawks are an abysmal 21-60, including zero wins away from Memorial Stadium. The story starts in 2009. Coming off two consecutive bowl victories and loaded with returning starters including quarterback Todd Reesing, running back Jake Sharp, receivers Dez Briscoe and Kerry Meier, defensive end Jake Laptad, safety Darrell Stuckey, and cornerback Chris Harris, the Jayhawks were primed for success. Early in the season, the high expectations seemed warranted. The Jayhawks quickly rattled off five consecutive victories to open the season. However, as soon as the success came, the wheels came off. Coach Mark Mangino’s team lost seven straight to end the season, and failed to reach a bowl game. In the midst of the seven game losing streak, the athletic department initiated an internal investigation of Mangino’s conduct, including alleged mistreatment of players. The results of the investigation resulted in immense public pressure for Mangino to be terminated, and in December 2009, Mangino and KU agreed to a contract buyout, ending one of the most controversial tenures in KU football history. His final record was 50-48, one of only three KU football coaches post-World War II with a winning record. George Sauer (1946-47) and Jules Sikes (1948-53) are the others. In December 2009, Mangino and KU agreed to a contract buyout, ending one of the most controversial tenures in KU football history. After the swift dismissal of Mangino, Director of Athletics Lew Perkins took to the coaching search in earnest. The press and fans floated many names, including Jim Harbaugh, then at Stanford University, to Skip Holtz, then at East Carolina University, to Tommy Tuberville, who had just gotten fired from the same position at Auburn University a year before, to Turner Gill, the former Nebraska quarterback and coach at the University of Buffalo. Each had positives and negatives. Harbaugh was successful at several stops, but wanted a bigger job. Skip Holtz was young and talented, but hadn’t taken ECU very far. Tuberville had proven success, but was he out of step? Gill revived a program from obscurity, but could he handle a high-profile job? On December 13, 2009, Turner Gill was announced as the next head coach of the Jayhawks. From the get-go, it seemed like a poor decision. Gill’s opening press conference drew poor reviews from many in the media. He seemed overwhelmed and not in command of the room or the gravity of the job. Gill’s announcement of Chuck Long as offensive coordinator and Carl Torbush as defensive coordinator raised eyebrows. His description of offensive and defensive schemes lacked specificity and coherence. Gill spent much of the presser talking about recruiting players without regard to scheme or fit beyond boilerplate “character” and “physicality” platitudes. Gill did mention beating Missouri as one of his top priorities, so the press conference wasn’t a total failure. On December 13, 2009, Turner Gill was announced as the next head coach of the Jayhawks. The Gill era on the field began about as well as his press conference, losing 6-3 to FCS school North Dakota State. The next week, hope abounded, as the Jayhawks upset #15 Georgia Tech at home by a score of 28-25. KU won a single conference game in 2010, overcoming a 45-17 deficit against Colorado. The first season under Gill was an abject failure at 3-9, and getting outscored 413-198. However, Gill and his staff still managed to sign a top-40 recruiting class, which included future contributors Tony Pierson, Michael Cummings, JaCorey Shepherd, Ben Heeney, Jake Love, and Michael Reynolds. The future seemed bright in Lawrence. The 2011 season started out with promise, with wins over McNeese State and Northern Illinois. From then on, the wheels seemed to come off, especially on defense. The Jayhawks defense gave up 60 or more points three times, and over 40 points in seven of twelve games. KU finished 120th in Division I in points allowed, out of 120 teams. The offense was nearly as poor. The Jayhawks did not finish in the top 100 in any offensive category but points scored. To make matters worse, the Jayhawks went 0-9 in conference play, ending on a 12-game Big 12 losing streak. The day after losing the final Border War football game to Missouri, Director of Athletics Dr. Sheahon Zenger unceremoniously fired Gill after posting a 5-19 record, including 1-16 in conference play. Gill’s poor record wasn’t the only thing that made KU fans and administrators uneasy about the future. Gill had an unusually coach-friendly contract, with no buyout clause. The remaining $6 million on Gill’s contract was owed to him in full, within 120 days. Dr. Zenger had no choice but to court donors into paying the remainder of Gill’s contract. KU finished 120th in Division I in points allowed, out of 120 teams. The offense was nearly as poor. This coaching search was sure to be a different process than Lew Perkins took two years earlier. Zenger wanted an established coordinator or head coach with Power Five conference experience. There were plenty of names rumored. Troy Calhoun (head coach at Air Force), Dirk Koetter (Jacksonville Jaguars offensive coordinator), Philip Fulmer (former head coach at Tennessee), Dave Christensen (head coach at Wyoming), Houston Nutt (former head coach at Ole Miss), Gus Malzahn (offensive coordinator at Auburn), Sonny Dykes (head coach at Louisiana Tech), and Chris Petersen (head coach at Boise State). There is one name conspicuously missing from this list. 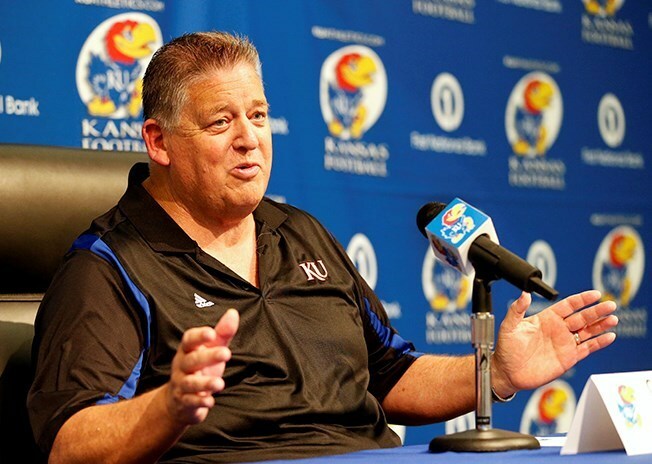 On December 9, 2011, it was announced that Charlie Weis, former offensive coordinator for the New England Patriots, Kansas City Chiefs, Florida Gators, and head coach at Notre Dame, would become the next head coach at the University of Kansas. For many, including the local press, the move was a head scratcher. Most in KU’s orbit wanted a new face at the head of the program, with fresh energy and outlook. Dykes or Petersen would have fit the bill nicely. Weis was none of that. The symbolism was strong. Because of poor health, Weis entered his first press conference with a cane. On December 9, 2011, it was announced that Charlie Weis, former offensive coordinator for the New England Patriots, Kansas City Chiefs, Florida Gators, and head coach at Notre Dame, would become the next head coach at the University of Kansas. Weis managed to make a splash right away, by signing former five-star quarterback prospects Dayne Crist and Jake Heaps as transfers. He promised to bring his pro-style brand of offensive football to KU and serve as offensive coordinator. He also hired former Dallas Cowboys head coach Dave Campo as defensive coordinator. The cupboard was far from bare in Lawrence, as Gill left behind two promising recruiting classes. The on-field product was not as promising. In 2012, the Jayhawks did not beat a single Bowl Subdivision team, only beating FCS school South Dakota State. KU also continued its conference losing streak, reaching a 21-loss streak. After promising a vaunted offense, Weis failed to deliver. KU ranked 118th out of 124 FBS teams in total offense, including passing for a paltry 149 yards per game. After promising a vaunted offense, Weis failed to deliver. KU ranked 118th out of 124 FBS teams in total offense, including passing for a paltry 149 yards per game. The staff chose an unusual path to improve for the 2013 season. 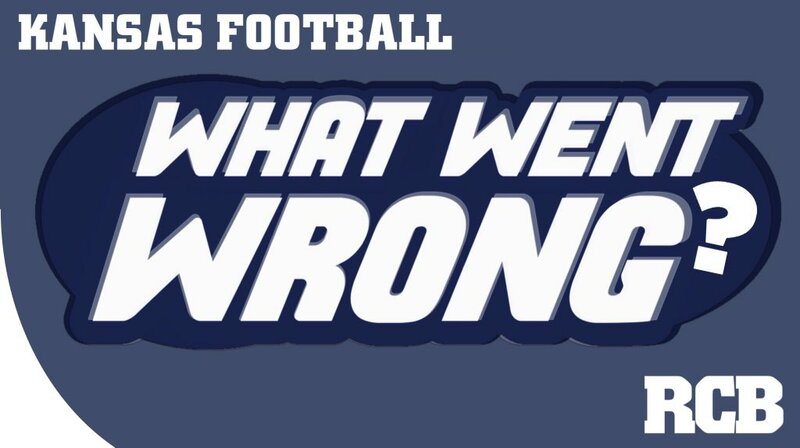 Weis threw 29 players off the team during his first season for various off-the-field reasons, a product of the lax atmosphere promoted by Turner Gill. To fill the roster spots, Weis looked west to Bill Snyder and Kansas State University for a strategy. Snyder’s teams always had more junior college players than most programs. This is, in part, due to the wealth of junior college talent in the state of Kansas. Butler County Junior College, Dodge City Community College, Hutchinson Junior College, and Highland Community College routinely produce quality Division 1 players from all over the country. The downside to signing junior college players is that many never see the field, for academic or other reasons. They also haven’t been in high quality strength and conditioning programs, and with only two seasons to play, there is limited time for a staff to develop their talent. Regardless of the risks, Weis and his staff needed bodies, and quickly. In the 2013 recruiting class, KU signed 19 junior college players, far above the usual numbers, even for a JuCo-heavy program like Kansas State. The gamble did not pay off. Ten of the 19 junior college recruits in the 2013 class never played a down for KU. This left the program in a lurch for the season, with little depth at key positions, especially on the lines. After dispatching FCS South Dakota, KU lost to perennial bottom-dweller Rice and beat struggling Louisiana Tech on a last second long field goal. The one bright spot in the season was November 16, when KU beat West Virginia 31-19. Weis’s “decided schematic advantage” failed to produce again. In the second year with a high profile quarterback, KU again failed to crack the top 110 in points scored, finishing 115th. The Jayhawks occasionally showed signs of life, but finished just 3-9. The 2014 team seemed promising. The Jayhawks returned most starters, and signed a top-50 recruiting class. Quarterback Montell Cozart was the unquestioned starter and had a talented supporting cast around him, including Tony Pierson, Corey Avery, Jimmay Mundine, Nick Harwell, and Nigel King. Defensively, playmakers Ben Heeney, Ben Goodman, Michael Reynolds, Victor Simmons, JaCorey Shepherd, and Isaiah Johnson returned. The Jayhawks never seemed to put it together. Even in the first game of the year, against FCS basement-dweller Southeast Missouri State, the Jayhawks squeaked out a six-point victory. After a 23-0 loss against Texas at home, Charlie Weis was fired for “lack of on-field performance” by Athletic Director Zenger. Weis finished his career at KU with a 6-22 record, including an abysmal 1-18 in Big 12 play. Defensive coordinator and KU alumnus Clint Bowen was named interim head coach. Weis finished his career at KU with a 6-22 record, including an abysmal 1-18 in Big 12 play. Defensive coordinator and KU alumnus Clint Bowen was named interim head coach. Bowen made a series of changes after taking the helm, especially on the offensive side of the football. He demoted coordinator John Reagan, and replaced him with wide receiver coach Eric Kiesau. He also made a change at the quarterback position, replacing the wildly inconsistent Cozart with veteran Michael Cummings. Under Bowen’s leadership, the Jayhawks improved markedly. The Jayhawks nearly pulled off two home upsets of ranked teams, losing by a combined 11 points to 16th ranked Oklahoma State and 5th ranked TCU on Senior Day. Bowen even won a conference game against Iowa State, 34-14. However, the Bowen regime did not end as successfully as it began. At Oklahoma, running back Samaje Perine ran for a NCAA Division FBS record 427 yards on 34 carries. The following week at rival Kansas State, the Wildcats hung 51 points on the hapless KU defense. The question after the season was clear, who would lead the Jayhawks into the 2015 season? Bowen, or yet another candidate? For KU’s third head coaching search in five years, Zenger brought in veteran executive Chuck Nienas to assist in the search. This time around, Zenger and the search committee did not focus in on sitting or former collegiate head coaches, though some were on the preliminary list, including Justin Fuente of Memphis. 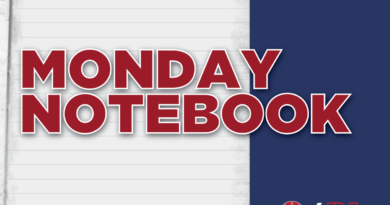 Other candidates were Bowen, Nebraska offensive coordinator Tim Beck, Ohio State offensive coordinator and former KU coordinator Ed Warinner, and Texas A&M wide receivers coach, recruiting coordinator and former KU wide receivers coach David Beaty. After a short search and interview process, David Beaty was announced as head coach December 5, 2014. After a short search and interview process, David Beaty was announced as head coach December 5, 2014. After all this, what can we surmise about how KU football went from Orange Bowl victors to basement dweller in such a short time? Even before KU hired Turner Gill, recruiting had fallen off dramatically under Mark Mangino. The staff was an abject failure at capitalizing on the success of the 2007-08 team to make the necessary facility and recruiting enhancements that a program like KU needs to maintain success. Even though he was an excellent recruiter by KU standards, Turner Gill added some fuel to the fire by bringing a lax compliance atmosphere and not properly developing talent. The hiring of Charlie Weis turned the fire into a full blown inferno by tossing over 20 players out of the program and filling their scholarships with high-risk junior college players. The demise of the program post-2008 is not the fault of one man, but a series of poor decisions across staffs and administrations that squandered any chance at sustained success, and instead drug the program to historic lows. Now it is David Beaty’s turn to take his best shot at turning around a Kansas football program that has wallowed in the basement of the NCAA for nearly a decade.